This herbal tea is the safest herbal product for blood pressure, hypertension, high cholesterol, fatigue, and blocked coronary arteries. It tones up and strengthens heart muscle and arterial system. It is a Nicotine/ Caffeine free herbal tea to take care of all heart problems and that too without any side effects. The regular uses can get the benefits of Arjun tea within first week of its usage. It helps lower down the cholesterol levels naturally and also gives strength to heart. Each herb in our tea has a specific purpose. Terminalia arjuna is the most useful of all the herbs for heart, described in Ayurveda. In this tea, Terminalia arjuna is used and many other herbs for blood pressure and cholesterol. 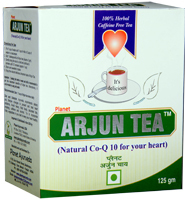 Arjun Tea is a unique gift of nature for patients suffering from heart problems, high cholesterol and blood pressure. Divine Remedies is one of the very few companies in the world who has utilized the ancient knowledge of herbs for heart problems in the form of a herbal tea for heart. The incidence of heart problems has risen many fold these days. Potential risk factors for heart disease and strokes are stressful lifestyle, lack of physical exercise, bad eating habits, smoking, anxiety, high blood pressure, high blood cholesterol levels, low Antioxidants in blood, low levels of Potassium, Calcium and Magnesium. In most of the cases heart attacks are caused by the obstruction to the coronary arteries. These are the blood vessels which travel through the wall of the heart and nourish the heart muscle. Since the heart muscle spends a huge amount of energy, it needs ceaseless nourishment. It naturally demands a good supply of blood. Any impairment of these blood vessels interferes with adequate blood flow to the heart muscles. If this blood flow is significantly diminished then the heart signals its difficulties by registering pain or discomfort in the chest and if the blockage in the coronaries is large enough, then it may cause an heart attack. Useful in Coronary artery disease, pump failure, cardiomyopathies, palpitations, IHD, post coronary artery bypass grafting, Angioplasty. Arjun Tea is being presented to you keeping in mind pure Ayurvedic, herbal ways of healing. The product comprises of safe herbs that have been into use in Ayurveda from times immemorial for above mentioned problems. Ayurveda-The ancient Indian healing system describes health as a state of complete physical, mental, social and spiritual well being. The foundation of this science lies on the basic theory of five elements considering humans as mixture of water, air, fire, earth and ether blended together with the immortal soul. 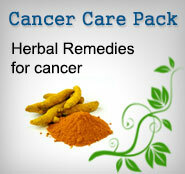 This healing system has been into practice in India for more than 5000 years. Utilizing herbs, minerals, proper nutrition, purification and above all, affirmative ways of living. The concept of Arjun Tea is based on preparation described in Ayurvedic texts as "Ksheer Pak" i.e. boiling the herbs in milk and water to get both water soluble and fat soluble liquid extracts from the herbs to get maximum benefits. Terminalia Arjuna: An Ayurvedic cardioprotective botanical being used in Ayurveda since 2500 B.C. has remarkable cardioprotective, heart muscle strengthening properties. *Current scientific research has proved that T.arjuna contains specific medically active constituents namely triterpine glycosides like arjunetosides I, II, III, IV, arjunine and arjunetein. The bark is rich in saponnins, natural anti-oxidants (flavonoids-arjunone,arjunolone,leteilin) gallic acid, ellagic acid, oligomeric proanthocyanidins, phytosterols, rich in minerals like calcium, magnesium,zinc and copper. *Regular use of T.arjuna improves pumping activity of heart, improves cardiac muscle strength, decrease in LDL cholesterol levels. *Bark of Arjuna tree has been found to be rich in Co-enzyme Q-10 which is highly prescribed in cardiology departments now a days to prevent heart problems. High amounts of Co-enzyme Q-10 prevents incident of heart attacks. Inula Racemosa: Another Ayurvedic botanical growing in upper Himalayas is a member of compositae family is in use since centuries as heart attack preventing medication.The sesquiterpene lactones from the herb improves rhythm of the heart, prevents anginal episodes, and controls cholesterol levels. Cinnamomum zeylanica: The spice known as "Dalchini" is a native to Indian subcontinent. It has remarkable cholesterol lowering properties. Regular use reduces episodes of breathlessness and clears the cholesterol from the blood, gives strength to heart muscle, vascular system and works as best natural anti-oxidant. Ayurveda recommends dietary and life style changes to prevent and treat heart problems. 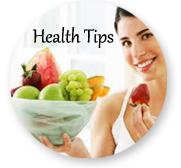 Fiber rich diet, green leafy vegetables, fruits like pomegranate, apples, guava are recommended. Heavy fried meals containing excess sugar, breads, meat and egg preparations, pulses and their preparations, curd, groundnut oil are strictly prohibited. Stimulants like smoking, tea, coffee and alcoholic drinks are very harmful for such patients. A 6 monthly screening of LDL-HDL balance, total cholesterol and triglycerides, levels. Reduce intake of common salt (Dietary Sodium). Get a deep sleep each night. Ayurveda recommends to control your desires and wishes to get rid of stress, hypertension and coronary artery disease. Yes, It is possible to reverse heart disease by doing moderate physical activity on a daily basis.